I DID IT! LOL, and I didn't even mean to/want to. BAH! I've been trying to grow radishes for SEVEN years. I try every year. I fail EVERY YEAR. I planted some this spring, they all went to seed, just like every other year. So, I planted some around my squash plants in hopes that when they flower, it will ward off bugs. So, what happens?? they made radishes! So, I can't grow radishes unless I'm actually trying not to grow radishes apparently LOL! I just can't believe this. Not only to your success at growing them, but they are fantastic!!!! It sounds like you are generally planting a little too late if they are bolting that fast. I think the reason it worked for you under the squash is because the squash offered some shade and therefore a little bit cooler environment. ....Maybe? My experience with radishes tells me that you can grow them about any time as long as you keep them damp. If they dry out they will bolt. jal_ut wrote: My experience with radishes tells me that you can grow them about any time as long as you keep them damp. If they dry out they will bolt. hmmm. that may be right. it has been SUPER rainy here, like rain every day. but, we had one dry week where I didn't water it becuase well, we kind of got 7 inches the week before LOL! it was a dry and hot week, and I didn't water it. I think that was the week they bolted. Maybe the moisture is the key then Either way, congrats on the success and not giving up on em! GardenRN wrote: Maybe the moisture is the key then Either way, congrats on the success and not giving up on em! I'm stubborn like that LOL. I had the same problem with carrots, couldn't grow a good carrot if I tried my best. One day I gave up, had about 100 extra carrot seeds. So I just tossed them out into my orchard. Low and behold next summer I was eating delicious carrots. Lesson is sometimes you need to let the plant be the plant and not your child. that is super funny! 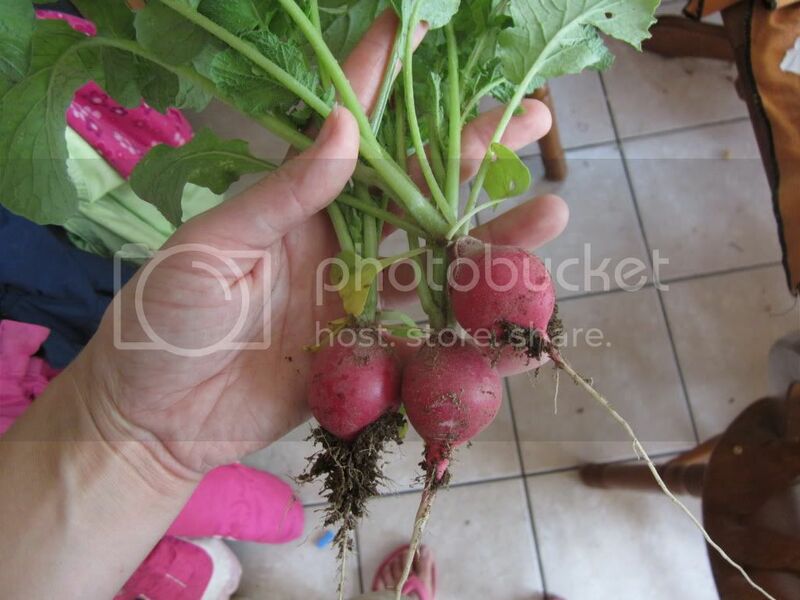 I never have babies the radishes though, I don't' really do anything to them since they never grow for me haha. maybe the first 2 years of trying I put forth effort. LOL. after that I was all, eh whatever. But I toss em in regardless. i figured it was my soil being too acidic. maybe the place I put the squash was where I put more lime, no idea! This is my first year getting radishes and carrots. I have only tried a few other years but I do think water is the trick. It is rewarding when you get a harvest from the seeds you start yourself.